How can you lead a generosity revolution in your church? We recently celebrated Independence Day in the U.S. – observing the birth of our nation with the signing of the Declaration of Independence. In reality, America wasn’t “born” that day – real independence wasn’t settled for another seven years. And in one sense of the word, we as a nation struggle for independence every day in myriad ways. The same could be said for generosity in your life and in your church. 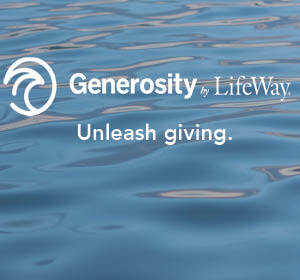 By whatever definition you attach to generosity, you may feel as if you’ve “arrived” and you lead a generous life. Your church may also be a shining example of generosity in your community. But the far more common state of both individuals and churches is not living generous life. You may be following some practices of generosity, but you can’t seem to get over the hump. You lead a church in the same situation. Maybe it’s time for a generosity revolution in both your life and your church. With all of the books written on stewardship and all of the workshops offered; why do churches continue to struggle with questions and issues of financial giving? The answer is in the church’s leadership. A revolution of generosity will only occur as pastors, financial chairs and stewardship chairs live and give witness to the importance of generosity in their personal lives and then intentionally recruit and train others to join the revolution. Leading a revolution in generosity is not about simply using the right program or reading the right book or preaching the right sermon; a revolution of generosity is about embracing, living and leading others on a journey of gratitude, prayer and faith. Generosity Rising instructs pastors on whom to recruit and how to recruit them, offering practical guidelines for training a dedicated team of “generosity revolutionaries.” This book also provides daily devotionals for leaders to inspire, motivate and encourage their personal journey of gratitude, prayer and faith. Generous churches come in all sizes, styles, and shapes. They all go about it differently, but the end result is the same. The generous church has a positive and healthy culture that leads to people wanting to do more. Generous churches are filled with people who will grow like never before and be looking for opportunities to bless others. Is your church a generous church like described above, or on the path to becoming a generous church? If not, maybe it’s time to evaluate your current generosity practices. How do we fan the flame of an uprising in generosity until the flame becomes the burning fire of a lasting revolution? Clear and compelling vision – If you want your revolution in generosity to be more than a temporary uprising, you need to be able to answer the question, “Why?” Why should people give their hard-earned dollars to your church? Because “we are the church” is no longer a sufficient answer. Tell stories of changed lives – A revolutionary vision for a compelling ministry that changes and transforms lives does no good when no one hears the story. Every newsletter, every worship service, every bulletin, every Facebook post, and every Tweet: all are opportunities to tell stories of change and transformation. Make it easy and convenient for people to give – Giving needs to be easy and convenient. There is nothing particularly holy or righteous about making people give only cash or checks, and only in the offering plate on Sunday morning. Say Thank You – Many of us were taught as children to always say thank you. Somehow the church has forgotten this early childhood lesson. Gratitude serves as a key link in the dynamic between receiving and giving. Set high expectations – High expectations for leadership and high expectations for your new members will insure the success of your revolution in generosity. Don’t forget God – Too often, we focus so much on techniques, programs, and numbers that we forget God. Every discussion about generosity and giving needs to be surrounded and immersed with opportunities for prayer and for cultivating our relationship with God. 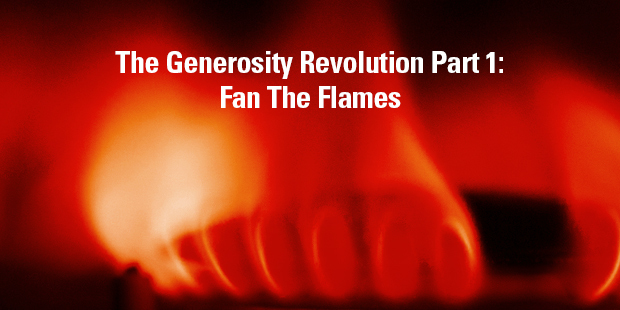 Fan the flames of your own generosity uprising by using some of author Scott McKenzie’s suggestions in each of the six areas above. On six chart tablets, list the six suggestions above. Then, write the following suggestions below, using them as a prompt for brainstorming with your team additional actions in each of the six areas. Some of the most exciting and growing churches have a clear and compelling vision for how God is changing their lives in their particular community. List these five irreducible questions of clarity on the chart tablet, and work through them with your team. Mission – What are we doing? Values – Why are we doing it? Strategy – How are we doing it? Measures –When are we successful? Vision Proper – Where is God taking us? How will you develop a clear and compelling vision? Every staff meeting and every leadership meeting should have time on the agenda for sharing stories of change and transformation. The sharing of stories can completely change your staff and leadership team’s morale, and bring them together in ways never seen before. What other ways can you tell stories of changed lives? Take an inventory of all your digital assets (websites, apps, social media platforms, etc.). Is there a clearly visible and easy-to-use “Donate” or “Give” button? If so, can someone on your team report how giving has grown through its use? If you do not have such a digital means of giving, begin exploring how you might adapt them. What other ways can you make it easy and convenient for people to give? Saying thank you in a variety of ways and in multiple settings is a crucial part of growing a generous church. It’s not just about money, either. Have you recently said “Thank You” in a significant way to volunteers in one of your ministry programs – for example, your VBS or kid’s camp volunteers? If so, what were some of their reactions? If not, what are you waiting for! Do you have clearly stated (and followed) expectations about generosity for your staff and leadership teams? If so, how have you recently celebrated stories of those expectations in practice? If not, how can you prayerfully begin the journey of creating these expectations and implementing them? How are you setting high expectations in generosity for yourself and your team? God has been and always will be the real change agent of the heart. Have you recently given people the opportunity to give witness to how God has moved in their lives? And not just in an annual campaign! What other ways can you help people to not forget God? Excerpt taken from SUMS Remix 71-1, July 2017. 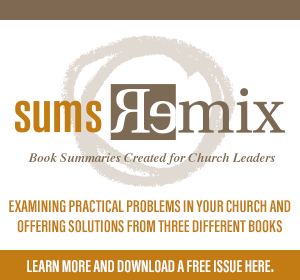 This is part of a weekly series posting content from one of the most innovative sources in the church world: SUMS Remix Book Summaries for church leaders.